There may be hedge-cutting taking place. Traffic calming measures may apply. There may be a pelican crossing ahead. 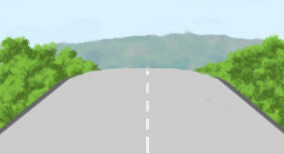 A high-sided vehicle may be approaching. Explantion: On the approach to the brow of a hill you should be extra careful and be prepared to react to a change in the traffic situation.